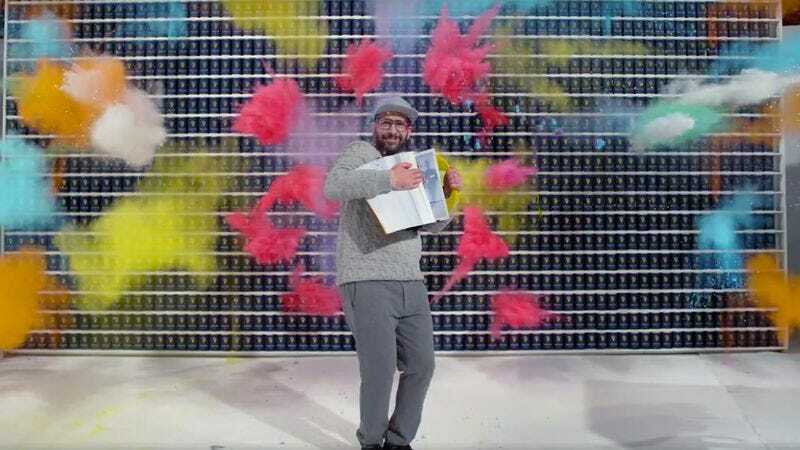 The members of OK Go have been trying to top themselves with increasingly elaborate music videos ever since their one-take treadmill video for “Here It Goes” became a viral hit in 2005. And considering their most recent video took them to the final frontier of space (or at least a zero-g environment), that seemed like an especially difficult task this time around. But having mastered space, Damian Kulash, Tim Nordwind, Dan Konopka, and Andy Ross decided to conquer time as well. Their new video for “The One Moment” features some colorful, chaotic explosions that unfold over the course of a few seconds in real time. Slowed down, however, the chaos syncs up perfectly with the band’s song. In terms of what it actually looked like to film the video, the first chaotic action unfolds in 4.2 seconds, followed by 16 seconds of real-time lip-synching, and another three seconds of action that was later slowed down. The video connects seven different camera movements into one seamless take. It’s a little tricky to grasp how everything came together (the band used a massive spreadsheet to plan it all out), but this behind-the-scenes video helps break down the process.